You can edit required deductibles and maximum benefits that are attached to an insurance plan. Along with coverage tables, deductibles and benefits allow for accurate insurance estimates. Tip: You can edit the deductibles met and benefits used for the current and previous years of a patient's insurance plan. Use the Patient Search box to access a patient's record. If the last patient record you accessed since you last logged on is the correct patient's record, you do not need to re-enter the patient's name in the Patient Search box. You can include inactive patients in the search results by setting the Include inactive patients switch to On. On the Patient menu, under General, click (or tap) Overview. The patient's Overview page opens. In the Insurance box, click (or tap) an insurance Plan link. On the Patient menu, under Insurance, click (or tap) Insurance Information. The patient's Insurance Information page opens. Click (or tap) an insurance plan. The options for editing insurance information become available. On the Home menu, under Insurance, click (or tap) Carriers. The Insurance Carriers page opens. The options for editing the insurance carrier become available. Under Plans/Employers, select an insurance plan. The options for editing the insurance plan become available. While viewing an insurance plan attached a patient's record, click (or tap) Benefits. While viewing an insurance plan that is associated with a specific insurance carrier, click (or tap) Benefits. 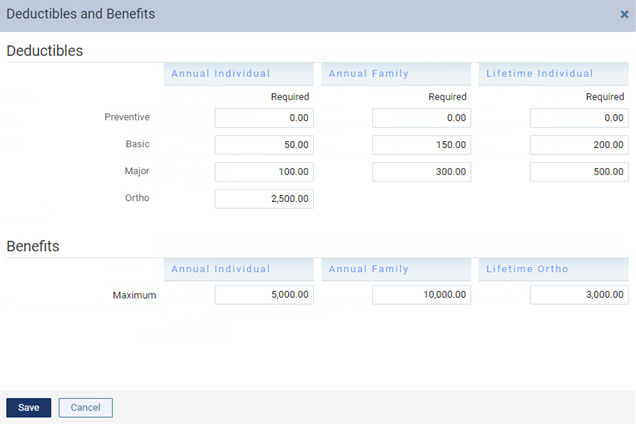 The Deductibles and Benefits dialog box appears. Change the deductibles and benefits of the plan as needed. Note: Currently Dentrix Ascend calculates the deductible for each category. 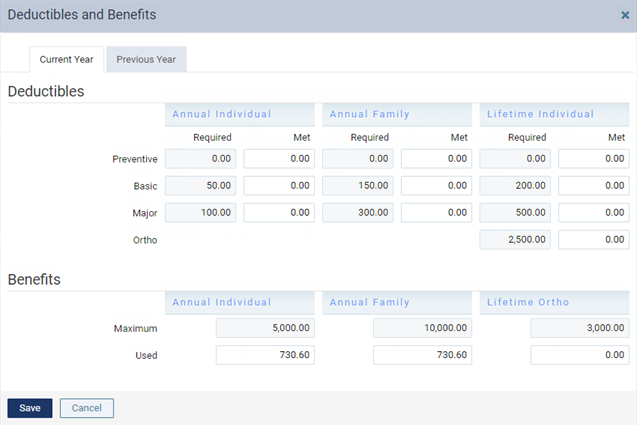 If there is only one deductible, enter the amount of the deductible in the Preventive, Basic, or Major box in each column (Annual Individual, Annual Family, and Lifetime Individual) as applicable unless preventive procedures do not require a deductible; in which case, enter the amount of the deductible in the Basic or Major box in each column as applicable. This will prevent Dentrix Ascend from calculating the deductible twice for a procedure, and it won't matter which type of procedure you post first. Additionally, you must update the coverage table for the plan. Make sure that all procedures, except for preventive procedures if they do not require a deductible, are associated with the deductible type that you entered an amount for. Do insurance benefits automatically update?